Center Ice Hockey is Top Shelf for 2013! Look for exiting product additions as well as Hockey Tips and other great information. We can also showcase your hockey products right here on this page. See our Contact Us page for more information. Click on our sponsors links for great deals. Only $ 4.99 Per pair! 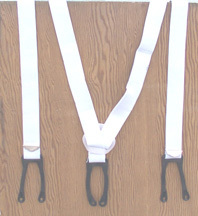 These heavy duty suspenders come in 3 sizes 44", 48", & 54". They are white with metal adjustment buckles, and heavy duty rubber button fastening straps. Hockey Giant brand. At this price order a couple pair. Size: Choose Size... 44" 48" 54"
Order the Backyard Ice Rink Secrets eBook! Get a head start on next winter. Be the envy of the whole neighborhood. Your kid could be the next Rick Nash or Cammi Granato!